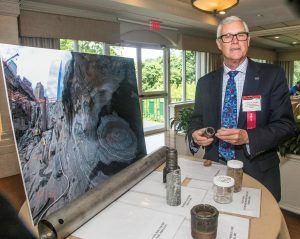 This year’s 6-PDH (HSW) course for Engineers on June 20 at the Tappan Hill Mansion featured lectures by a panel of leading industry specialists on subjects that included high-performance concrete, BIM, 3-D modeling, subsurface exploration for foundation design and construction, reducing engineers’ liabilities and OSHA safety. Alfred H. Brand, PE, technical specialist of Mueser Rutledge Consulting Engineers, gave a presentation, Subsurface Exploration for Foundation Design & Construction at the morning seminar. 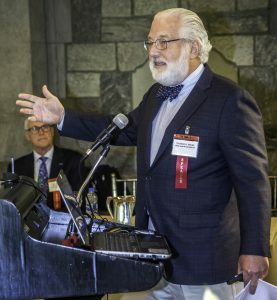 Ross J. Pepe, executive director of the CAI, served as program moderator and introduced each of the six guest speakers. They were: William S. Phelan, concrete consultant honorary member and fellow at ACI, The Euclid Chemical Company; Michael J. Squarzini, P.E., managing principal of Thornton Tomasetti; Alfred H. Brand, PE, tecnical specialist with Mueser Rutledge Consulting Engineers; Thomas McCarthy, compliance assistance specialist of US Department of Labor/OSHA; Thomas H. Welby, Esq., P.E., and Anthony Carlucci, Esq., both of the law firm Welby, Brady & Greenblatt LLP. For the last session of this year’s program, attendees were brought by motor coach to the Haverstraw Marina to board the River Rose for a technical study tour of the new Gov. Mario M. Cuomo Bridge and the old Tappan Zee Bridge. Since its inception in 2010, CAI’s continuing education program for P.E.s has served over 700 New York State-licensed engineers who have earned Professional Development Hours toward license renewals. Thomas H. Welby, Esq., P.E., of the law firm Welby, Brady & Greenblatt, LLP, discussed during the morning seminar series the topic of Reducing Engineering Liabilities. Halcyon Construction’s Charlie Casarella, P.E., reviews details of the Gov. 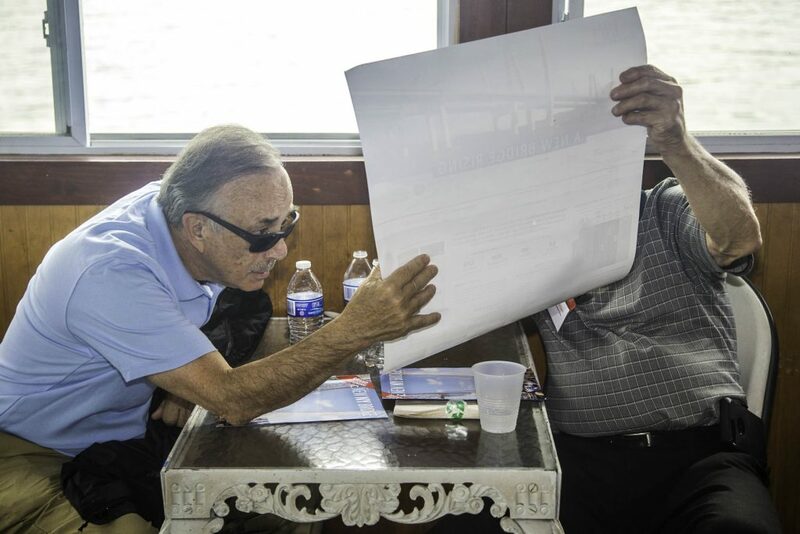 Mario M. Cuomo Bridge project with company partner Joe Zuzzolo, P.E., on a boat tour of the Hudson River construction zone on Wed., June 20.
boarded an authentic Mississippi paddle-wheeler June 20 to get a bird’s eye view of the ongoing construction of the new Gov. Mario M. Cuomo Bridge and to see the ongoing dismantling of the former Tappan Zee Bridge. During the course of the technical study tour, New York Thruway Authority’s Andrew O’Rourke, Tappan Zee Bridge Project Information Office, presented an insightful and entertaining explanation of many of the finer points of this $3.9-billion project. His hour-long presentation highlighted many of the unique challenges the Thruway Authority and the design-build contractor Tappan Zee Constructors faced as they worked to deliver the project that began in early 2013. In slightly more than 60 months, all westbound lanes are open, and the eastbound (southern span) is scheduled to be operational for traffic by the fall of this year. 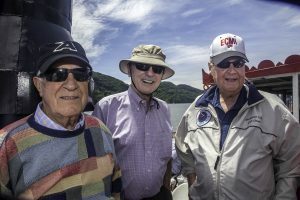 The four-hour tour on the River Rose, which is moored in the Haverstraw Marina in Rockland, was presented and sponsored by Tarrytown-based Construction Advancement Institute and the Building Contractors Association, both of Westchester and The MidHudson Region, Inc. The ninemile voyage to the construction site offered a panoramic vista of the entire 3.1-mile bridge span. 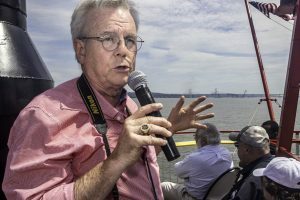 As the River Rose maneuvered through the shipping channel, visitors could see witness up close the remaining steel and concrete portions of the former Tappan Zee Bridge. NYS Thruway Authority’s Andrew O’Rourke, Jr., delivered a lively and comprehensive technical review of the construction activity required to build the new Gov. Mario M. Cuomo Bridge. He also discussed the challenges to dismantle the 63-year-old Tappan Zee Bridge. Mr. O’Rourke began his presentation by praising both the more than 7,000 union construction tradesmen and women who have worked on the project and the Construction Industry Council that launched a public-awareness campaign BuildTheBridgeNowNY.org that garnered widespread support in the years and months prior to the start of the project. “The CIC was there from the beginning and when we had our first town meeting they assembled all the workers out there,” he said. “The level of experience, the level of respect and the level of intensity that these people (construction workers) have for the job that they do is simply unbelievable,” Mr. O’Rourke added. He then launched into the engineering and hard science of the project. For example, the finer points of the construction of the new cable-stay span compared to the old span’s cantilever truss design were addressed as well as some behind the scenes perspectives on the project some never thought would ever get built. 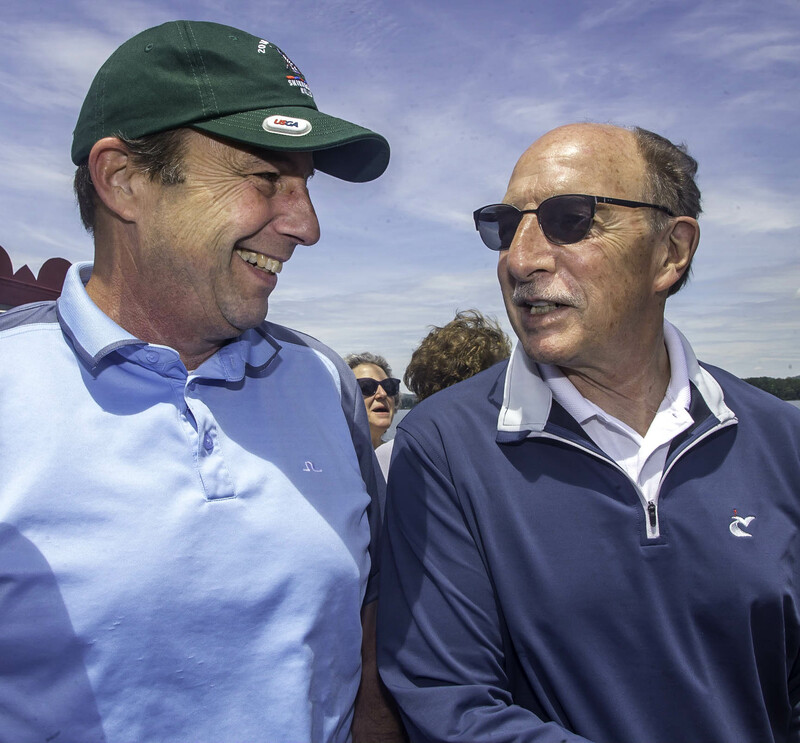 From left, Hill International’s labor specialist Jim O’Neill for the Tappan Zee Bridge replacement project and Jack Frazier of American Global enjoying the four-hour boat tour on the Hudson. creating a large bullpen of desks so that personnel could work side-by-side in one expansive office. 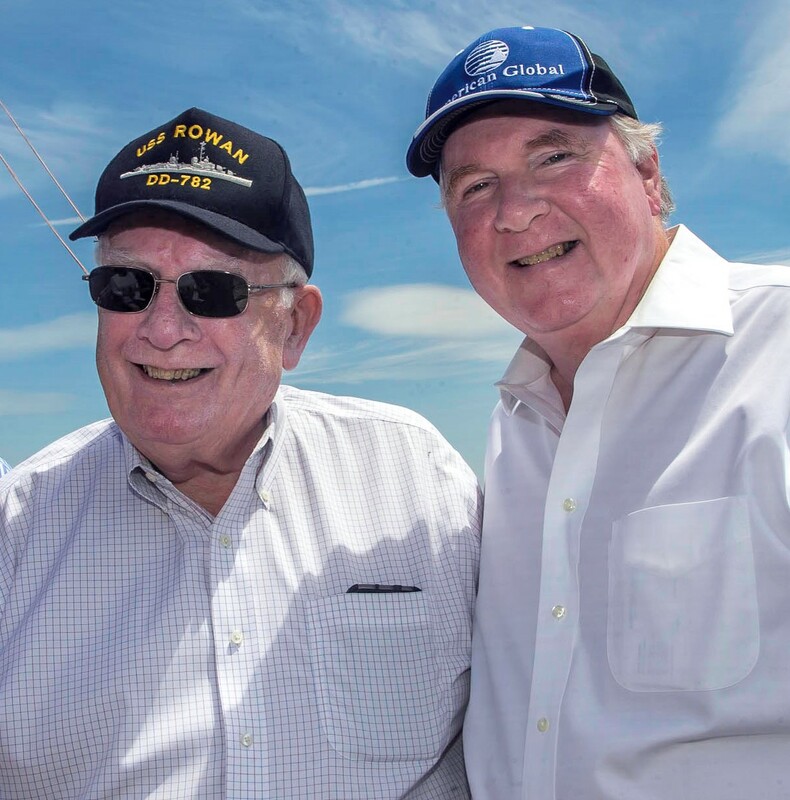 This fostered “connectivity between the contractors, the owners and the owners’ engineers,” Mr. O’Rourke observed. cause. These are “great people, great families, great workers, great Americans—everyone of them who became friends at the end of the day.” He related that the design of the new bridge span involved some 450 engineers who were not only located at Tappan Zee Constructors’ local project site; they spanned the globe, from Tokyo and London and other places around the world, resulting in more a bridge design that involved more than one million man-hours. 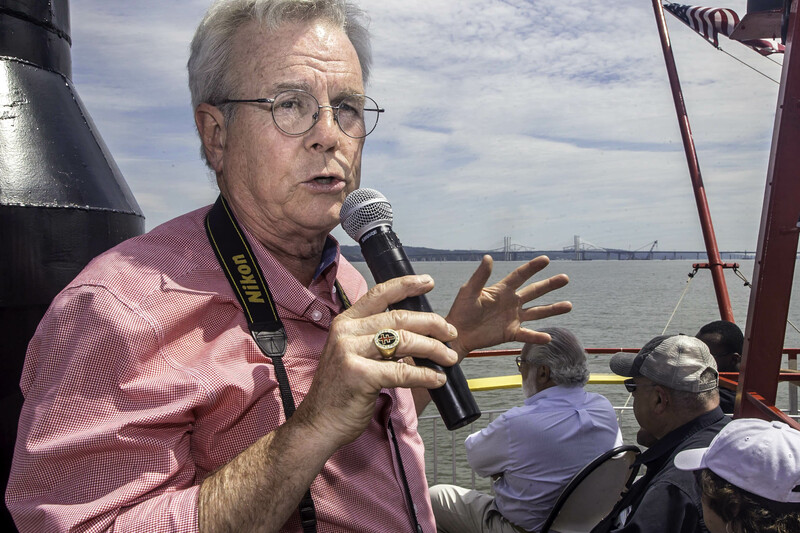 Despite the laws of gravity—or maybe because of it—dismantling the old Tappan Zee Bridge has proven more difficult than originally anticipated, he revealed. From left, CIC/BCA Clean Water Project Coordinator David Miller with CIC/BCA President Ross J. Pepe. From left, Fairway Testing’s Pat Aguanno, Joe Corless, P.E. and CIC Board Member Jerry Keahon. decision” by Gov. Andrew Cuomo back in October 2011 to scrap a plan to create a transportation corridor from Suffern to Port Chester that would include a bridge to simply focusing on the construction of a new modern span that could accommodate mass transit in the future. The decision to focus on the construction of a replacement span and change the project from a state to a federally regulated project, along with the decision to employ a Design-Build process, expedited the approval process and the eventual construction of the new Mario M. Cuomo Bridge, he noted. display in the dining quarters of the River Rose, which gave the professional engineers and other guests the chance to touch and appreciate the sophisticated and state-of-the-art ingredients and items that are going into building the largest public works construction project in the United States. P.E.s received six continuing professional education credits for the daylong program that began at with morning classroom sessions at Tappan Hill Mansion on the latest advances in materials and technologies used in building and construction today.